Birmingham will be one of the first cities to benefit from proposals announced today by Openreach for a major acceleration of its ultrafast fibre broadband network. Openreach, Britain’s national broadband infrastructure provider, has announced proposals to extend by 50 per cent its target for rolling out Fibre to the Premises (FTTP) to reach 3 million premises across the UK by the end of 2020 through a new ‘Fibre First’ programme. Eight major cities - Birmingham, Bristol, Cardiff, Edinburgh, Leeds, Liverpool, London and Manchester - make up the first phase of Openreach’s Fibre First programme which will connect up to 40 UK towns, cities and boroughs with FTTP networks, with build starting in 2018. It is expected that tens of thousands of Birmingham homes and businesses will benefit from this latest multi million pound expansion. Further details of the roll-out in the city are expected to be announced later in the year. According to independent website thinkbroadband, 96.6 per cent of Birmingham households and businesses already have access to superfast broadband speeds of 24Mbps and above. Openreach will continue to focus on delivering FTTP to rural areas, in partnership with the Government, to make sure some of the hardest to reach communities in the UK,get access to future-proofed, FTTP networks. Clive Selley, chief executive of Openreach, said: “Through the Fibre First programme, Openreach is getting on with the job of building an Ultrafast Britain. We are accelerating our plans to build FTTP to three million premises by 2020 which sets the course to reach ten million by the mid-2020s with the right conditions. Where possible going forward, we will ‘fibre first’. “Working closely with central and local government and our communication provider customers, we will identify the cities, towns and rural areas where we can build a future-proofed, FTTP network that’s capable of delivering gigabit speeds to all homes and businesses at an affordable cost. Reaching three million premises by 2020 sets Openreach on the right trajectory to achieve its ambition of building a ten million FTTP footprint by the mid-2020s and, if the conditions are right, to go significantly beyond, bringing the benefits of FTTP to the majority homes and businesses across the UK. Andy Street, Mayor of the West Midlands, said: “I committed in my manifesto to helping every business and household in the West Midlands have access to superfast broadband and this announcement by Openreach to provide ultrafast broadband is an important step in this. “A world-class city deserves world-class digital infrastructure, and we believe full-fibre technology will be key to unlocking the long-term productivity of businesses in this region, particularly our vibrant tech and digital businesses. The pace and extent of this large-scale investment will depend on the speed with which the conditions to enable an acceptable return on the investment are secured. Support is needed from communication providers (CPs), central and local government and the regulator to deliver key enablers, including: achieving low build and connection costs; achieving rapid take-up of and generating incremental revenue from the platform; and having a supportive regulatory and public policy framework. As with any infrastructure investment, if Openreach is unable to secure an acceptable return, it will need to review its ongoing capital commitments to the programme. Gfast* remains a critical component of Openreach’s ultrafast strategy and an important platform that will be deployed at scale in the UK to millions of premises. Gfast allows Openreach to deliver ultrafast speeds over existing copper lines. It builds on existing Openreach networks, so it is quick to deploy with minimal disruption and at relatively low cost. Openreach remains committed to rolling out Gfast at speed. Openreach will employ a Fibre First ethos and will not build Gfast and FTTP to the same locations. An initial consultation by Openreach, which was open to all CPs and concluded in autumn 2017, found there was broad support for Openreach to start building a large-scale FTTP network in the UK. The consultation also helped Openreach to identify a set of enablers needed to underpin a viable commercial business case.The enablers remain important for the first wave of FTTP investment to be successful, and critical for Openreach to sustain a high rate of build into the mid-2020s and reach its ambition of 10m premises. The cost of building FTTP varies significantly depending on the exact location.Openreach expects the cost of building FTTP in towns and cities over the next three years to be around £300-£400 per premise passed.If the costs of battery back-up are excluded for the majority of customers, we expect connection costs to be around £150 - £175. The consultation identified three sources of value: lower Openreach operating costs enabled by the new platform; incremental revenue per line from Openreach’s wholesale charges to CPs; and the benefit to Openreach from a more competitive network.Our further analysis continues to indicate that all three sources of value will be needed to secure acceptable returns. To maximise the potential of a large-scale new FTTP deployment, Openreach believes it is essential to move all customers onto the new network quickly once built. 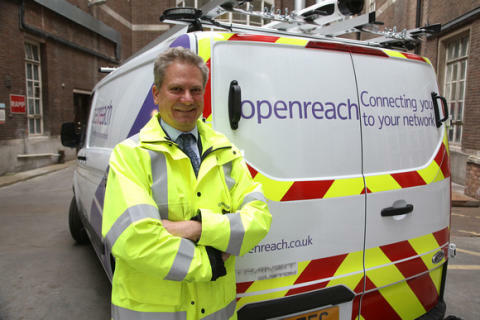 In the first instance Openreach believes mass market adoption at competitive prices can be pursued through commercial agreements with CPs, and will explore models to achieve this in parallel with accelerating its FTTP build.Ultimately a ‘switchover’ process will be required, moving all customers onto the FTTP network so that everyone benefits.Openreach will consult with CPs and other stakeholders on how this can be achieved in due course. ii. certainty around the fair bet framework to ensure that initial and subsequent rounds of investment have the opportunity to earn returns that fully reflect the risk taken at the time of investment and where competition is effective, greater commercial freedom. iv. close partnerships with local authorities to reduce red tape and provide a smooth path to delivery. Openreach has already piloted a co-located Fibre First team with the City of London Corporation and will now replicate this model with other local authorities as part of the Fibre First project. Enquiries about this story can be made to Emma Tennant at the regional press office on 0800 085 0660 or the Openreach PR team at press@openreach.co.uk. The Fibre First programme will see Openreach build FTTP to a further c.800,000 premises in BDUK areas and new housing sites, and to c.1.7 million premises in towns and cities. FTTP connections can deliver ultrafast speeds up to 1Gbps. Openreach has already provided 500,000 residential premises in Britain with access to FTTP, the majority of which are in rural areas. Current connection charges for Ultrafast FTTP 160Mbps range from £92 to £117. Openreach’s current ultrafast FTTP pricing ranges from £19.78 to £21.39 for 160Mbps with connection fees of £92.